It must be that time of year, or more likely the “going out of business” state finance system continuing to take its toll on districts in Wisconsin. Five more districts have placed referenda Fall ballots. That brings the total to ten by my count, eight for operation and maintenance and two to issue debt for, renovating and upgrades. I posted before on the September 9 Colby measures, one of the debt referenda. Interestingly like Colby’s, the other debt referendum — A November 4th vote in the Clinton Community School District — also includes an attempt to move toward energy efficiency and environmentally sound practices, in this case via a Geo-Thermal heating system (Milton is also looking at Geo-Thermal). With this and the other items, Clinton is trying to plan for the future in ways that our school funding system makes nearly impossible. The district could wait to ask residents to pay for new projects, but [Board President Randy] Gracyalny said gambling on the economy improving and prices going down isn’t a move he wants to make. “Where will we be three years from now?” he asked. “I don’t know. No one knows. We know where we are now. It is a smart approach and I wish them the best (more here). In the districts seeking to pay for operations and maintenance it is the usual recipe of costs rising faster than allowed revenues, with added seasoning of declining enrollments for some. Democracy has diminished and that is sad because children learn from adults and what they see is disrespect for others’ opinions and bossy individuals who control meetings to delay or stop procedures. Of course, all people are not guilty of such actions. Amberg, a few years ago, opted to join the Wausaukee School District. Was that an error? Now it is possible these student will ride to Crivitz. Teachers, school boards and parents, are you happy about all your adult complications? I give credit to all who try to make it right. Small towns cannot survive peaceably when all this divides friends and parents and teaches some children to rebel, be bossy, be bullies, show disrespect and have drinking problems. You tell ’em Gert. There is also a good commentary on the Wausaukee situation from Ken Krall at NewsoftheNorth.Net. 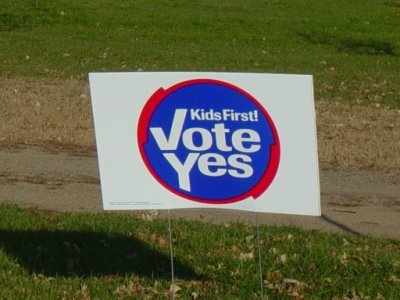 Deerfield, Neillsville, and Montello will all vote on September 9. Deerfield is asking for a five-year nonrecurring, with annual amounts starting at $275,000 and going to $475,000 (another version of planning for the future). Deerfield appointed a Citizens Advisory Committee last year to work on the plan and surveyed the community before proceeding. They’ve also put together a very nice web page explaining the what the referendum is about. Madison could learn some things from our neighbors fifteen miles to the East. Neillsville has been experiencing declining enrollment at a rate of 30 or more students a year and started out as a low spending district in 1993 when the revenue caps were put in place. This is a double whammy. District spending levels are still based on what they spent over 15 years ago; because the caps are set on per member basis, declining enrollment –especially in small districts — makes it increasingly hard to cover fixed costs such as heating and transportation and almost impossible to pay for diverse offerings that larger districts take for granted. As Superintendent John Gair said: “”We’re at the point now where departments are made up of one person in some cases. If we reduce (spending) any more, we’re going to lose programs for kids.” To meet these challenges, Neilsville is asking for a five-year, $300,000 a year increase in the amount of revenue they are allowed to collect. According to District Administrator Jeff Holmes, Montello is one year away from joining Wausaukee in dissolution (or exploring consolidation). Last September two referenda were defeated; one operating and one to borrow for things like resurfacing the parking lot and replacing air conditioning. They cut for administrators last year and have not replaced retiring teachers. This time they are going to ask for a two-year non recurring $950,000 increase in their revenue limits. If it passes, two years isn’t very long. Unless the Governor and the Legislators do something quick, they will have to go back to the voters again. Lafarge, Mercer, Seneca, and Pittsville all have November 4 referenda scheduled. Some may remember that in 2000 disputed ballots in the Lafarge referendum went all the way to State Supreme Court, which after years of litigation upheld “the intent of the voter” precedents and a referendum victory (unfortunately that same year the US Supreme Court threw away precedent and the Constitution and gave the Presidency to George W. Bush). This time Lafarge is one of two districts (thus far) asking for a recurring referendum, in the amount of $250,000 annually. Approve the new referendum to keep the school open. Close the school and dissolve the district. “Dissolving” was also mentioned. They are asking for four-year, $350,000 per year revenue cap relief. Seneca is another small enrollment, rural district with declining enrollment. I’ve described above what this does to the ability to give students the education they deserve, the Institute for Wisconsin’s Future’s Atlas of School Finance goes into more detail. They are asking for $800,000 a year on a recurring basis. Pittsville covers 440 square miles and serves 686 students. Wrap you mind around that and you will understand that districts like this are essential (consolidate into a district that serves 1,300 students spread over 1,000 square miles?) and do not enjoy the economies that larger, more compact districts have. Because of these these issues and projected declining enrollment, the plan in Pittsville is to decrease staff even if the three-year $175,000 nonrecurring referendum passes. These posts are a lot of work, but they are also rewarding. I learn about the districts in Wisconsin, the good they are doing, their hopes and dreams. I urge you to visit a few of the district web sites linked here; look at the pictures, read the mission statements, find things like Pittsville’s “Why enroll your child at Pittsville?” and sense the pride and dedication. You will find it rewarding too. On most of these web sites I also see the logo for “The New Wisconsin Promise,” and wonder if the slogan “A Quality Education for Every Child” is some kind of sick joke. Our schools — even those in dire financial straits — are still doing a fine job, but how much longer can they and we hang on? Why can’t we put in place a way of investing in our children’s future that makes those words an accurate boast? Why not Governor Doyle? Why not Senators and Assembly members? Why not? Take the five minutes to click the links and ask them. Maybe if enough of us do, something will change.